It has been a while. It seems to be getting longer between updates. Probably a reflection of Melanie and I becoming more apathetic about what we are doing. Since our last update we have had three charters one of which we are currently on and will finnish tomorrow. Christmas was an entertaining affair all be it a little sad being so far from our family and friends. We have been a little slack in communicating christmas cheer and wishes of luck for the year ahead to all of our friends, better late than never. So Merry christmas and all the best for the year ahead to you all. Christmas day was one where we invited a number of other expats. who were without family to an all day christmas party on the Bahama Mama, some people have no style when it comes to naming a boat. Melanie managed to buy a bunch of seafood and more seafood for christmas dinner and of course no shortage of alcoholic beverage. We ended up with a Kiwi, a Pom, a Yarpi and a Yank, very cosmopolitan. The Pom and the Kiwi arrived about 2 hours after everyone else started eating and drinking but the were well and truly attitude adjusted and were both experiencing some technical difficulties. We have video to prove it but at this stage it is not for general exhibition. Christmas lunch was a hit and went from about 11.00 am till about 11.00pm and before we new it it was new years eve. 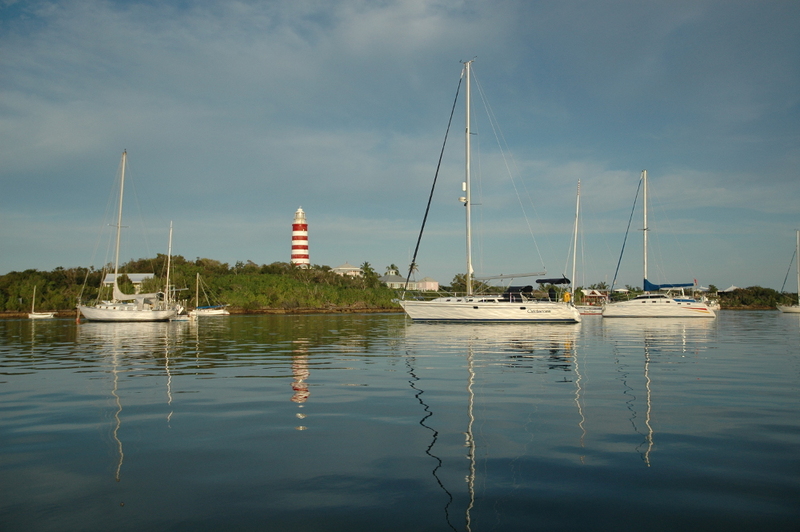 As it turned out we stayed in Marsh Harbour as we had a charter commencing on the morning of the 2nd. it proved to be the wrong decision as we later heard Hopetown went off and Marsh Harbour was fairly dull. Mel: David spent the day of New Years Eve, helping a friend of ours, Clay, hip tow his $10, 47′ Cuttyhunk design ‘Chandelle’ from Marsh Harbour to an Island called Green turtle Cay. A distance of around 20 miles and involving a brief passage into the sometimes very nasty Atlantic. They were extordinarily lucky with the weather and had no wind glassy conditions. Clay is a captain of one of the support boats on the set of Pirates of the Caribbean 2 &amp; 3. He has since towed his boat from Green Turtle to Freeport on Grand Bahama, where is is going to get carpenters on the set help fix up ‘Chandelle’ in exchange for the use of his 21′ whaler. We spent New Years with Clay, his mum and sister, all oringinally from Kentucky, it was quiet, but fun. The amazing thing is David and I managed to stay past midnight. The ongoing joke around here is the 9pm is the Bahamiam midnight. No kidding we are in bed around 9pm most nights, if not before. On the charter front the week before christmas we had a family from Atlanta, Mum and Dad and three daughters. They were fantastic people. Very friendly, appreciative of what we were doing for them and generous. Went some way to restoring our faith in human nature. Gerry the dad loved a beer and we spent many a night in a bar or on the boat drinking beer and talking crap. The next charter was a little different. A Cuban American guy, his wife and three daughters. What a contrast. That charter ended and another started the one we are on now. These people are fantastic. The first three days was husband and wife, son and daughter in law, 2 children and the pilot of their own jet. The next four days just the older couple. We have had so much fun with them. They have taken us out to the best restaurants on 2 occasions so far and they are very appreciative of every thing we do. We have a 24 hour turn around tomorrow for a week long charter with 8 guests, even though there is only beds for 6. It turns out that we are getting 4 adults and 4 kids, two 3 year olds and two 5 year olds. It is going to be a nightmare if the weather is bad! After this next charter we have a month with no charters until the end of our contract at the end of Feb. We are going to go to Freeport on Grand Bahama where we have a friend working on the set of Pirates of the Caribbean 2 and 3. He has assured us he can get us on the set to have a look around. Should be fun. Doggy is doing a Star boat regatta in Miami and hopefully will get over to visit us after his regatta finishes. We are still unsure as to whether we will stay on with Moorings for another month after our contract ends. We have not discussed it with them, but we are sure they will want us to stay for at least March. They have both crewed boats booked for at least 3 weeks in March and if we leave they will have no crews for what amounts to 6 weeks of charters. Knowing how difficult it is to get work permits for The Bahamas and the fact that after March they do not have any overlapping bookings will mean we should be able to negotiate something if we want to. Having said that if we are not out of here at the end of Feb we will definately be out of here at the end of March, we have had enough of the Bahamas for sure. After that we will spend some time in the States, not sure how long, then we will go to Cabarete in the Dominican Republic for some kite boarding, apparently the kite boarding mecca, then on to Uk and Europe. The plan is still to try to get some sort of van we can live in, nothing flash just something we can sell for a similar price we bought it for about 3 months later. So you are on notice Charlsey, what can we get and how much do we have to spend. And then home. Of coarse all that could change with Melanie and I, if we get sick of traveling we could be home in 2 months. All depends on how we are feeling on the day. We certainly miss home, family, friends and the dogs but it is going to be tuff to settle back into some sort of normal routine. What ever that is! It is about a month since our last update and again a fair bit has happened. Dad is recovering well from his 9 hour open heart surgery. Unfortunately the job on the Mary Jane stalled out as the boat got left in West Palm and was subsequently hammered in hurricane Wilma. The eye of the hurricane went directly over West Palm and at one stage in its life it had the lowest ever recorded barometric pressure of 882 mb. We were happy with our choice to get out of Marsh Harbour, while they did not get hammered the phone and internet service did go down for about a week. Freeport on Grand Bahama about 60 miles away did get hammered with a life lost. We spent about 3 weeks in the states on this visit, spending about half the time with our friends in Orlando and bout half touring around the South Eastern States. Gary planned a 5 day tour for us so we could see as big a cross section of the region as possible. Our fist trip was to Savannah in Georgia. On the way to Georgia we stopped of at the Daytona Harley Davidson dealership. The newest and largest Harley dealership in the world. It was more like a Harley theme park with a massive show room and a Harley Hotel complete with accommodation and a Chapel to get cash & carried just in case you got the urge. In Savannah we stayed in a great little B & B close enough to the old town that we could walk every where. Savannah is an old slaving and cotton farming town and I believe one of the first places settled in the region possibly even the States. It was a fascinating place steeped in tradition. 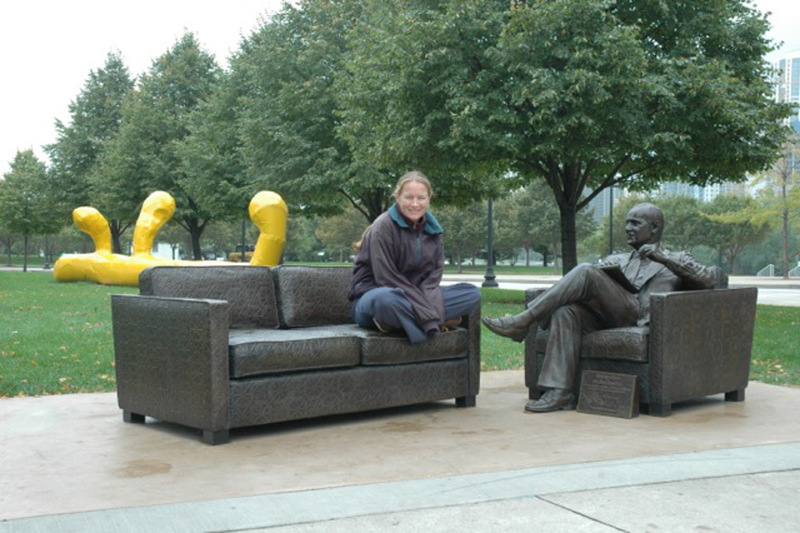 Melanie and I both loved it and planned to come back at a later stage. We were on a bit of a schedule as our friends Gary & Santa were keen for us to get back to Orlando to experience Halloween with there boys. After a night in Savannah we headed for a log cabin in the Appalachian mountains near a township named Butler in Tennessee. It was about an 8 hour drive through some really pretty mountains with the Autumn leaves starting to show. At night the temperature got down to around freezing which was a shock to our system given the warm climate we have been living in. We left the Iron Mountain Log cabin the next morning heading for Nashville. On the way to Nashville we encountered a couple of things that we thought quite bizarre. The first was at a fuel stop on the out skirts of a town called Johnson not far from Butler. We pulled up to get “gas” and parked next to us was a normal looking Jeep Cherokee except that it had a very recently killed deer complete with antlers strapped to a little platform on the tow bar. This deer had a bullet whole in its neck with blood still dripping! Inside the gas station there was a bloke with his son (about 12). There camouflage pants were covered in blood. The amazing thing was no one but us was batting an eyelid. Not far down the track we were driving along and Melanie says “There’s a giraffe and there is a zebra standing next to it!” I nearly ran off the road. We doubled back to check it out and as we went back we spotted antelope, gazelle and kudu. We thought it must have been an open range zoo, but no it was some ones private collection. Warning keep out signs every where. Now is that weird, or is it just us? On to Nashville. We got there late in the afternoon and went into the main drag which is The Broadway to check it out. The Broadway is like any other street in the the middle of a big town centre except there were mainly bars that had live country music playing the whole time they were open. Having seen enough to know we were going to come back later in the evening when the action started hotting up we headed for our hotel out between the airport and The Grand Ole opry. We managed to get tickets to the 6.30pm show but had no idea who was playing. There were well over 10 performers with Winona Judd and Brad Paisley having the top billing. It was a great show and something that Melanie and I will remember for a long time. After the Grand Ole opry we went into down for a bit of a bar crawl down The Broadway. There were obviously some famous performers in town as some of the bars had extraordinarily long queues outside. We did not feel like queueing at 10.00 pm so we started of with a smaller bar that had some great sounding country rock playing inside. Can’t remember the name of the band but they were fantastic. After about an hour and a couple of beers we moved on t another bar a couple of doors down. Another band playing more classic country or pretty much anything you requested. Musically they were excellent and very entertaining. We stayed for a couple of hours and then moved on to another bar. We were amazed every bar had great live music and all the bands were playing for tips. After a long night we finally decided to head back to our hotel so the next day would not be a complete write off. We spent the following day checking out some music shops and some western shops with the most extensive range of cow boy boots you could imagine. One music shop was a Gibson only outlet, it was massive and sold nothing but Gibson. It also had a workshop for repairs and special order instruments and they also assembled Banjo’s! I was in pig heaven. There were Gibson Banjo’s hanging on the wall that retailed for over $25000.00 US. 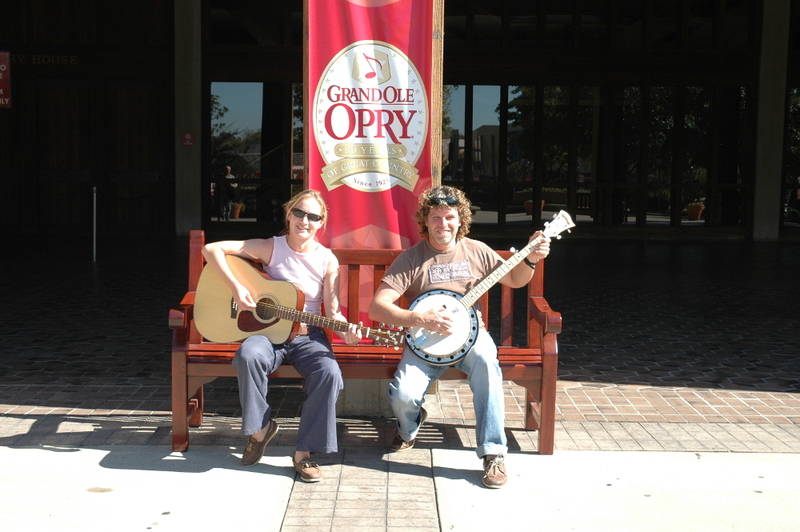 We went back to the Grand Ole opry and set up out the front Melanie with her guitar and me with the Banjo. We got a passer bye to take a photo of us playing out the front of The Grand Ole opry. Lucky there is no sound on pictures. Late that afternoon we started the long drive back to Orlando. We drove until about 11.00pm, about an hour south of Atlanta and stayed in a dodgy highway side hotel. The other thing that amazed us was the obsession with fire works. Fire works were available every where in the state of Georgia. They even had massive fire works ware houses that were situated right nest to the main inter-states and they were open 24 hours a day and they were lit up like christmas trees. We finally made it back to Orlando in time to spend Halloween with Santa, Gary, Alex & Marlie. Halloween was kind of novel. The adults tell you it is mainly for the kids but it looked like the adults were getting just as big a kick out of it. Some of the adults went to enormous trouble and expense to create costumes that would terrify the kids. The other thing that was unusual was that for such a big national celebration no one could tell us what it was really about or what its significance was. We had a day or two in Orlando before heading off to St Augustine and Savannah again. On the way to St Augustine we stopped of at the Outback Crab Shack which was on a back water of the Johnson River inland from St Augustine. 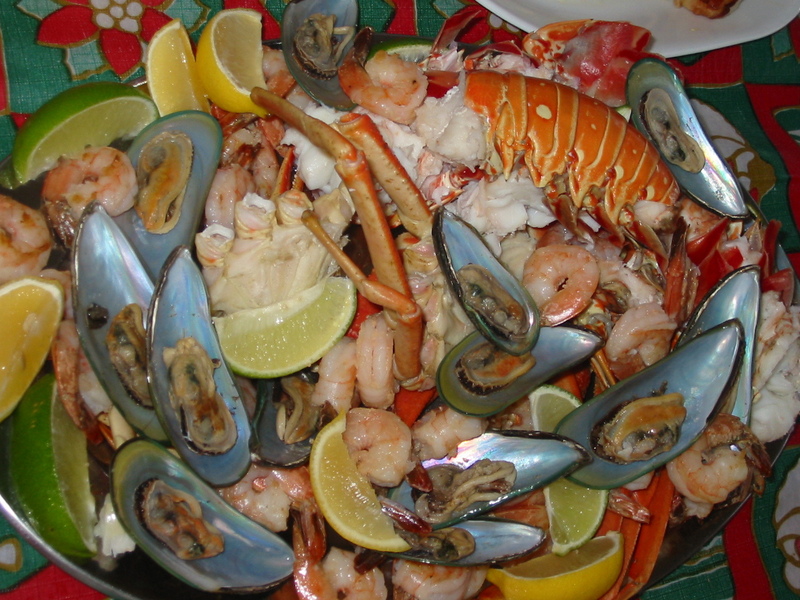 We had a Low country Broil which was shrimp, (we would call them prawns) yabbies, crabs, corn and smoked meat all boiled up in the same pot then sprinkled with cajun spices. It was without doubt the best meal we had had out since leaving home which tells you more about the food in general than this particular meal. Any way it was fun all washed down with a couple of Coronas. We got to St Augustine to find Gary had booked us in to another quaint little B & B. St Augustine was ok but no where near as charming as Savannah. We had a quick look around that afternoon and decided to head up to Savannah first thing in the morning. Something we have become very impressed with along this coast line is the Intra Coastal Water Way. It is an inland protected water way that runs from Miami all the way to Chesapeake bay, maybe even further I’m not sure. Melanie and I decided it would be a worth while exercise to try get a power cruiser and travel the entire length of it. A lot of it is man made and a significant engineering feat. One thing that I am totally frustrated by is the Yanks total in ability to pour a draft beer. Melanie says I am starting to sound like a broken record but this is so amazing because they don’t even know how it should look or taste. I have been so appalled by the insipid flat things that have been served to me I have resorted to photographing some as I’m sure people would not believe they could be that bad. Oh for an icy cold Carlton at the RBYC bar. We got to Savannah about lunch time and spent the afternoon just wandering around enjoying the old world charm. That evening we went on a ghost tour. It was a trip in horse and cart through the oldest darkest parts of Savannah over all the cobble stone streets with tales told of slavery, smuggling and of course the most famous ghost stories. It was a memorable experience. The next morning we left for Orlando with a side trip planned to Cocoa Beach. The home of the largest Ron Jon surf where outlet you could imagine. I t was well worth the drive it was huge, it had the most amazing range of surf wear and home wares with the beach and surfing theme being common throughout. We had a huge session of retail therapy, doing a large part of our Christmas shopping. Back in Orlando we spent another couple of days shopping and hanging out with Gary and Santa before gritting our teeth and facing up to the reality of going back to the rock. Something neither of us was looking forward to. We also managed to catch up with Richard Hill one evening in Orlando. He was over with 3 other guys to attend the Air Nautique dealer meeting. We had a really late night and a big drink at the Aussie Steak house or something like that. Not much Australian about it except large cans of Fosters that was brewed in Canada and tasted as bad as any other American beer. It was great to catch up with Ric and a real pity we couldn’t get him out to the Bahamas for a few days. We decide to fly directly from Orlando to Marsh Harbour to minimize the flight changes and the difficulties in US airports since S 11. We have been finding that our relatively frequent trips to the states over the last 6 weeks combined with the stamps in our passports from obscure Caribbean islands over the last 10 months and my general scruffy appearance was causing us to get the third degree at every airport security check point and immigration check. Anyway back to reality in Marsh Harbour. As soon as we arrived back we were informed that we were no longer working on Meltemia and would be working on a boat called Bahama Mama. This did not really please us as we had worked really hard to get Meltemia set up the way we like it and to eliminate all the bugs in the mechanical, electrical and plumbing systems. We found Bahama Mama in what we considered to be very average condition. So for the next 5 days we worked flat out getting Bahama Mama ready to go out on charter and Meltemia ready to take Melanies Mum and dad out on. We wanted Bahama Mama charter ready before we left on Meltemia with Melanies mum and dad so we could maximize the time we could spend with them. The plan was to come back on dock the afternoon before we went out on charter which eventually worked out well. We had a great time with mum and dad. They took the Meltemia out for 4 days by themselves, which would have been great. They handled the boat exceptionally well given the average conditions, rain and wind gusting over 30 knots. They left us with a bunch of christmas presents to open on Christmas day and a fibre optic Christmas tree. It was tough to wave them of. Last we heard they were bar hoping in Memphis having too many late nights and freezing. Any way thats about all for now. Well a lot can happen in a month! We had a trip to Florida and spent 4 days in Orlando and then 2 days in Ft Lauderdale. We had a ball in Orlando staying with our friends doing some things that you would only get to do by knowing someone. We visited a couple of the natural springs in the area and having a river boat ride to see the local flora and fauna. We hit the shops big time and I purchased a banjo and Mel got a guitar. ;While we were in Lauderdale we stayed in the Riverside hotel which was right in the middle of the good bit, it was an old hotel that had been renovated in keeping with its original period. Melanie thought the best part was the flushing toilet, the bath and the king size bed. thought the best part was the bar with the draft beer on tap. We caught up with Adam Lambert the first day we were there and had a look at the 135ft motor yacht he has just started on. It is undergoing a major refit and then taking a year to make passage to Australia via the Caribbean and the Pacific. This white boat industry in Ft Lauderdale has to be seen to be believed, there is so much money going around you have to wonder where it comes from!After checking out Adam’s boat we basically got trashed. A couple of bars more beers than I can count and a massive hang over the next morning.&#xD;&#xD;Melanie and I had the next day to explore the Intra Coastal Waterway in the local water taxi, which was all day get on and off as many times as you like for $5.00. Adam had suggested we travel up to Palm Beach to look at the boat he had been working on He suggested there may be a chance for Mel and I to get his old job. We met him at palm beach that evening and checked out the boat, a 100 footer and in beautiful condition, a real credit to the way Adam has looked after it. Our initial reaction was to be totaly overwhelmed by the size and the responsability. As Adam was showing us over the boat we realized that if he was around to help we may just be able to do it. We left feeling it was a great opportunity but we had some issues to resolve, like our contract with Moorings, the trip back down to The Grenadines on Meltemia that we had friends and Melanies Mum and dad comming over for. Our general feeling was while it was a great opportunity and the money would be excellent we were really looking forward to going back down island. We told Adam we would think on it and get back to him the next day. So back on the bug smasher to Marsh Harbour the next day should have been an easy process but the airline would not let us board to go back to the Bahamas as we did not have a ticket out and our work permits still had not come through. After much tooing and froing we had to purchase a full refundable fare back to the States before we could board. For the next day Mel and I could not get this job opportunity off our mind we just kept comming back to it. That afternoon the Moorings came back to us and said that because the other crew at Marsh Harbour had resigned we would probably not be going back to the Grenadines. We were pissed off to the max. We had only confirmed with them 2 weeks ago that the boat would definately be going. Ric Hill, Fred Haes and Glen Feris were booked on flights to come and do the delivery as far as the BVI’s with us. Melanies Mum and Dad were going to meet us in St Marten to sail down to St Lucia with us. This was part of the reason we were at first hesitant to go for the job on the big boat as we were really looking forward to doing the passage with these guys. On top of all that we had had enough of The Bahamas. We were really struggling entertaining ourselves while off charter. There is nothing to do and the place had gone dead quiet due to the hurricane season. The only thing that kept us going was the prospect of going down island at the end of October. All of a sudden it was clear our trip down island with our friend was probably not going to happen so we should go full tilt at the job on the Mary Jane. Adam forwarded our resume’s to the owner and gave us his contact details. We waited a day and rang. The guy said he would pay our airfares and put us up in a down town hotel if we would fly to Chicago to meet him. He said worst case we will not get the job but have a free trip to Chicago. We were on a flight to Chicago a week later. Chicago was great but cold. Peter picked us up at the airport, took us to lunch and then gave us a car tour of Chicago. He was a nice bloke and we got on well with him. He also has an I 70 that he races on lake Michigan in the summer and keeps in heated boat storage during the winter. He is retired and has his own Lear jet! He dropped us of at the Radisson right in the heart of Chicago said to enjoy ourselves and he would get back to us after in about a week. So Back to Marsh Harbour. Just before we went to Chicago we got some bad news. My dads health had deteriorated and he has to have His aortic valve replaced. This is the same op he had about 4 years ago so we new it was pretty serious and there was a chance I might need to travel home to see him before he went in to hospital. Melanie and I got back into the work routine after 2 trips to the states in 14 days. We were preparing for a charter due to start on the 25th. That was when Hurricane Wilma started brewing. All the computer models predicted it would do a turn to the north east and head straight for the Abaco’s were we are. Within 24 hours it had the lowest barometric pressure for an Atlantic hurricane ever, 882 millibars. It was already a cat 5 after only 24 hours. At about this point we hear that dad is scheduled to have his op on Monday Oz time. From Marsh harbour it was going to be nearly impossible to get back in time to see him before hand so we decide to at least get to Florida for a couple of reasons. 1. get out of the path of the hurricane 2. be somewhere where we can contact home or get there in a hurry if we need to. Even with tropical storm strength winds communication become really unreliable in the Cays. So its back on a bug smasher back to Florida where our friend Gary picked us up from the airport in Miami and took us to there home in Orlando, which is where we are now. Wilma came through Florida with a vengeance and and absolutely hammered southern Florida. We were in Orlando and copped tropical storm conditions, not to bad and the sun was back out shortly after. We are going to hang around in the States for a week or so and see if we can swing the job on the Mary Jane, and while we are here we may as well go on a bit of a road trip. All for now more soon. We are having a holiday, vacation for our American friends. Yep we are going to go to Florida for a few days. It will be the first time in seven months that we will have had a night of Meltemia and over eight months since having time of the islands. A big city, shopping, department stores, movies, disneyland, music stores, people wow. We plan on spending some time in Orlando with Santa and Gary from Caribbean Travel and Life magazine, they were guests on the boat a few months back and have developed into great friends and they have a schnauzer! We are also going to spend a few nights in Fort Lauderdale, check out the huge boating scene over there and hopefully catch up with Adam Lambert for a beer or two. We are looking forward to shopping for some basic things that are difficult to get in the islands. We are flying over Friday morning on a small, small puddle jumper which I am not looking forward to. As far as the weather, at this stage it has all been pretty tame in this area. We have had a few Tropical Storms pass over including Katrina and Rita generally turning into hurricanes within 24hrs of passing through this area. We enjoy the change in the weather when the TSs come over. The blustery, raining conditions are actually a welcome change from the constant heat. You will be pleased to know that the water temperature is back down to around a pleasant 31 degrees Celsius. We are hoping that we don’t have to deal with any more than a TS. Last year in October this area was hammered twice by hurricanes including a cat 5 and they are still in the rebuilding process.